House Bill 125 “The Extreme Crimes Protection Act” is scheduled for a hearing by the House Judiciary Committee in the House chamber next Wednesday, May 3, 2017 at 2:30 p. m. in Legislative Hall in Dover. You have a chance to testify against this bill that plans to bring back Delaware’s ineffective, unjust, and biased death penalty. To testify, prepare a 2 minute (about 250) word statement. Plan to arrive early to add your name to the sign-in list. If you want to elaborate beyond the two minutes you may submit further remarks in writing, but they are likely to limit spoken testimony to 2 minutes. For talking points, check out our links: Why Keep Delaware Death Penalty Free and Resource Links. Please keep in mind that the Law Enforcement Memorial Service is set for noon on that same day. Since the murder last week of Cpl Stephen Ballard, emotions will be running very high, especially among the law enforcement community. Please be respectful. We encourage everyone to attend, to testify, and to publicize this opportunity to participate in the legislative process. Please call your State Representatives as well as members of the House Judiciary Committee. Calls on any day are important, but calls on May 2nd, 3rd, and 4th are likely to have the most impact. You can identify your State Rep. by going to the General Assembly website and using the Who is My Legislator tool. You can reach any legislator by calling the general number at (302) 744-4114. Urge them to prevent the return of Delaware’s death penalty. Thank you for your dedication and work to Keep Delaware Death Penalty Free. On Sunday, the Movement for a Culture of Peace (MCP) moves forward with its plans to convene in the midst of the extreme violence and trauma that our Delaware community has seen this week. With collective community input, we will develop a more holistic Action Plan for Peace that includes our work against the Death Penalty. Sunday’s action forum invites a present, hurting community, complete with raw wounds and complex emotional experiences in a holistic and inclusive plan. We urge you to come prepared to think radically about how we address the extraordinary amount of trauma as a result of violence and the intersectionality of our holistic movement toward a true culture of peace in Delaware. It will require all of our actions to keep the death penalty from being reinstated in the Delaware Legislature. 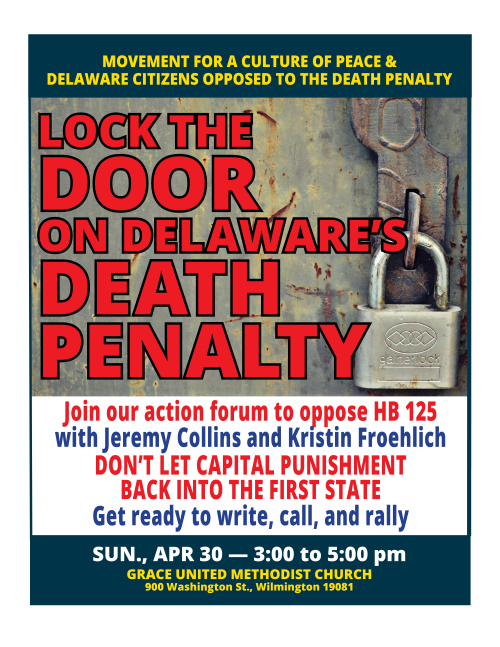 Please attend our next meeting to find out the crucial role that you can play in keeping Delaware Death Penalty Free! We will meet at 5:30 pm in the Wilmington Friends Meeting Social Room, 401 N. West Street, Wilmington, DE 19801. All are welcome. Newark Natural Foods, 230 E. Main St, Newark, DE 19711 (in the Newark Shopping Center). Free parking. We are doing a group “Letter to the Editor” writing event to help educate readers on why the death penalty is wrong for Delaware. Don’t know how to write a great letter to the editor? You can simply learn by doing! We will have a short presentation so you can learn what makes a good letter, and see some quality examples. Then, you can write your letter, get it proofread, get information to include in your letter, enjoy some pizza, and send your letter to the major Delaware publications. Please bring a laptop if you have one!!!! House Bill 125 will attempt to bring the death penalty back to Delaware. Monday April 4th, legislators introduced House Bill 125 to reinstate Delaware’s death penalty: AN ACT TO AMEND TITLE 11 OF THE DELAWARE CODE RELATING TO THE EXTREME CRIMES PROTECTION ACT. Click on the link for the full details of the bill. Click here to read the full text of the bill. We need your help to prevent HB 125 from sending Delaware back to the dark ages. Please contact your state legislators and tell them you oppose this bill. To get the contact info of your legislators, go to State Legislators and type your address in the Who Is My Legislator? box on the top right. To send a letter to your go to sample letter. Personalize the letter. Click here to see other reasons to keep Delaware death penalty-free. Letters to the editor are also helpful, especially downstate where support for the death penalty is most fierce.